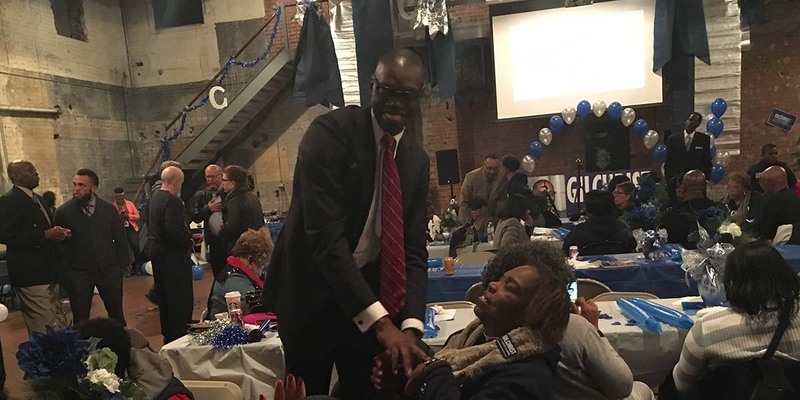 Detroit city clerk candidate Garlin Gilchrist II is betting that elections troubles that plagued the city last year not only continue, but may have cost him the election. Gilchrist announced Tuesday that he will seek a recount of all absentee ballots by Wednesday. He also may seek to recount other precincts as well. The announcement came about an hour after the Wayne County Board of Canvassers certified results of Detroit’s Nov. 7 election. Gilchrist lost about 2 percent to incumbent Clerk Janice Winfrey. He said his goal isn't so much as to overturn the results as to ensure Detroit has a transparent voting process. Gilchrist said he made the decision after hearing from several residents that they had problems voting, including those who say they showed up at precincts and were told by workers they had already cast absentee ballots. "It's critical that we trust our election system and especially as we go into the 2018 election cycle. Increasing trust in the process is key to increasing voter turnout," he announced at his campaign headquarters. "Our campaign brought transparency and accountability to the forefront and a recount is the (extra) step in that process." The recount will seek to determine not only whether Gilchrist won the election, but if the Detroit Elections Department has resolved problems with ballot counting. Detroit made national headlines during last year’s statewide presidential recount when much of the city could not be recounted because the vote tallies did not equal the number of people who voted. Nearly 60 percent of the city’s precincts could not be recounted because the number of voters recorded in poll books did not match the number of ballots counted, county officials found. A post-election audit of 136 Detroit precincts last year by the Michigan Secretary of State found poll workers’ errors were the source of problems, not fraud. On Nov. 7, Gilchrist led Winfrey in early returns until absentee votes were tallied. Winfrey had trailed by as much as about 10 percentage points, but ended up winning by 1,482 votes. The absentee ballots also were called into question in a lawsuit that was filed on Nov. 10 alleging that the elections workers had used copies of the absentee ballot envelopes to verify votes instead of using the originals. Anita Belle, an election challenger, accused the elections officials of keeping the absentee ballot envelopes out of sight of from elections challengers in an attempt to commit “ballot stuffing” or fraud behind closed doors. The lawsuit sought to throw out all of the city’s 30,000-plus absentee ballots, but a Wayne County Circuit Court judge on Friday dismissed the case saying there was no evidence of fraud. Daniel Baxter, the city’s elections director, told Bridge on Friday the city “feels good” about this year’s election after having added more training for poll workers and new voting machines. By state law, Gilchrist must pay $125 per precinct for the recount. The city has 590 precincts, including 100 absentee precincts. “The best thing that could happen for Garlin Gilchrist is the recount exposes that we have just as many problems in the electoral process, if not more, which raises questions about this election,” said political consultant Mario Morrow, president and CEO of Mario Morrow and Associates public relations firm in Detroit. I voted absentee. The ballot was plain and simple. Gilchrist should give the system a chance.